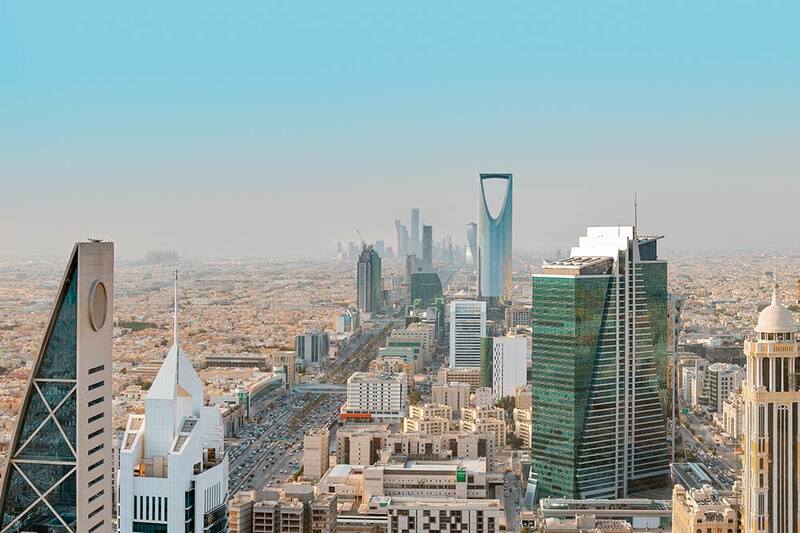 The largest city of the Kingdom of Saudi Arabia, Riyadh entices visitors with a blend of history and culture along side a thriving business district. This conservative capital of “The Forbidden Kingdom” has emerged in recent years to a vibrant city with excellent shopping and attractions. Business class flights to Riyadh with Just Fly Business will get you there in style and comfort, often at lower than booking with the airline direct. Your professional consultant will source the best value flights, as well as amazing deals on hotels, tours, car hire, and transfers to ensure that your holiday or business trip is suited to your needs. Cheap business class flights to Riyadh offer passengers a journey that will have them disembarking relaxed and refreshed, with the comfort and service of a premium cabin to ensure that you arrive ready for your destination. Working with all major scheduled airlines to ensure the best value option, Just Fly Business can also create a fully ATOL protected package encompassing all aspects of your trip for your financial security. Couple this with our 98% customer service rating from Feefo and Just Fly Business is the only choice for business class flights to Riyadh. Whether on business flights to Riyadh or travelling for leisure, contact Just Fly Business today and speak to the friendly and knowledgeable team to help organise your cheap business class flight to Riyadh. This 19th century fort consists of four 18 metre towers surrounding an ancient castle. Hailed as an important site in Saudi Arabia’s history, it was here in 1902 at this architectural marvel that Ibn Saud led his troops to recapture the city of Riyadh and unify the country under one ruler. Located in the Old Town, the fort is now a museum showcasing traditional Saudi living arrangements, costumes, and contains photo exhibits of historical places and civilisations within the kingdom. Insider’s Tip: Entrance to the museum is free, but check days and times before arriving as there are specific times for men, women, and families. Escape the city in a 4×4 and head north to the Edge of the World, a surreal landscape of rocky cliffs overlooking a vast valley. 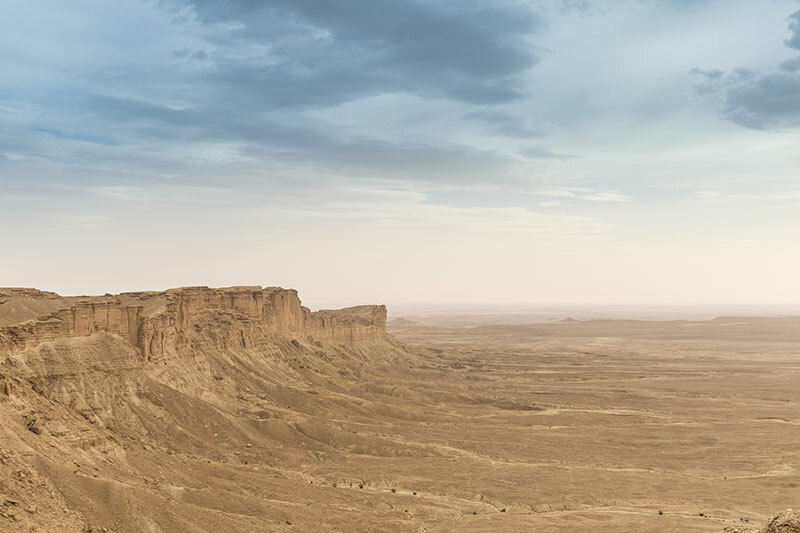 Popular with lovers of the outdoors, the Tuwaiq Escarpment gives the appearance of being at the edge of the world from the precipice. The Acacia Valley below has changed significantly over time as it is believed to once have been an ocean floor. The Red Sand Dunes to the south of Riyadh have created a modern tourist attraction, giving an adrenalin fuelled experience for those looking for some adventure. Quad bikes are available to rent allowing exploration of this beautifully stark area, but be aware of the midday heat in this desert landscape as there is no shade to be had. Insider’s Tip: Tours are available to both locations and are the preferred method for tourists. For the independent, car hire is available to men as it is illegal for women to drive in Saudi Arabia. The unmistakable Kingdom Centre tower that rises from Riyadh’s skyline offers visitors a unique perspective of this evolving city. Containing chic boutiques such as Gucci, Cartier, and Giorgio Armani, in its modern mall on the lower levels, the tower also houses the 5 star Four Seasons Hotel Riyadh. Rising above the hotel on the 99th Floor, the Sky Bridge reveals panoramic views of the city that amaze both during the day and the night. 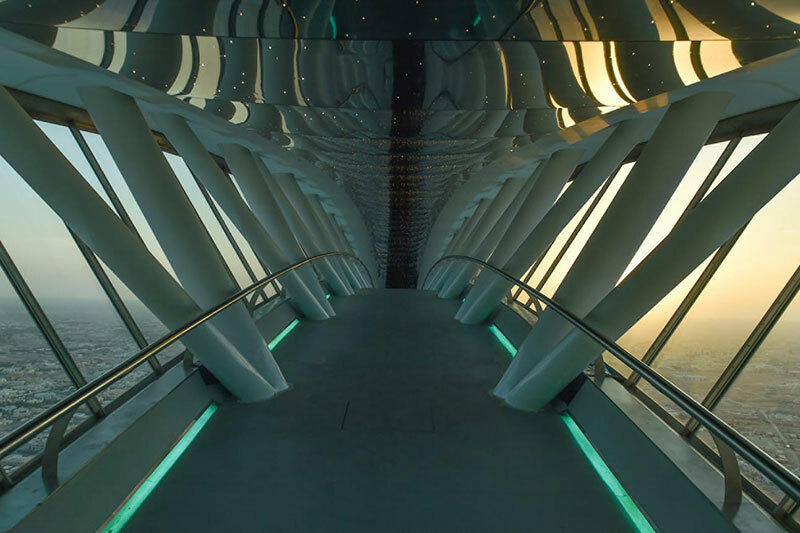 The 56 metre span between the towers is not for the faint of heart, but is a rewarding experience for those who are game. Despite its recent modern business outlook, much of Riyadh is still very traditional, with markets showcasing a wide range of goods from local foods, art, carpets, clothes, gold, and souvenirs. Deerah Souq, located behind the Al Masmak Fort, comprises of narrow alleyways filled with stalls that are fascinating to wander. Make sure to haggle and pick up a bargain! Insider’s Tip: For the best experience, visit on any day other than Friday as the crowds are smaller. Located next to the King Abdul Aziz International Conference Centre, the Ritz-Carlton Riyadh has conference rooms, board rooms, seminar rooms, and event spaces that will suit all your business needs. 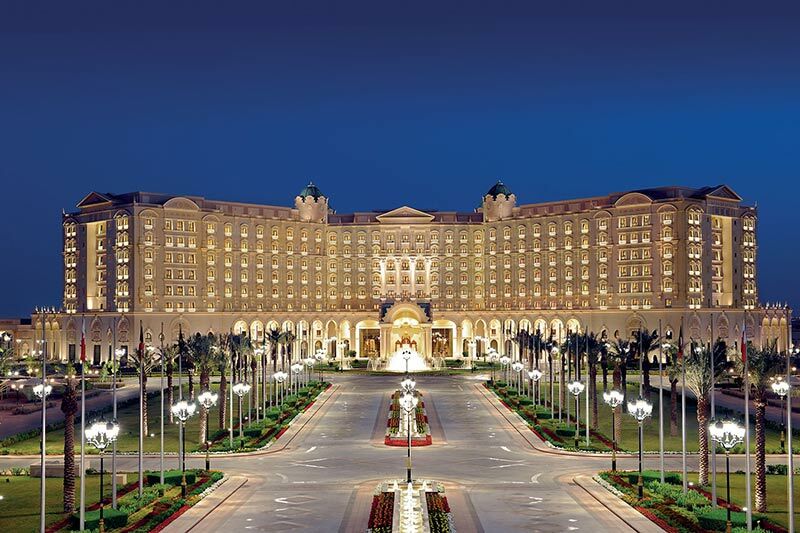 Perfectly situated in the business district on King Fahd Road, the Sheraton Riyadh Hotel & Towers is an excellent option for your next business meeting in Riyadh. To the east of Riyadh, the city of Dammam is joined to the island of Bahrain by the King Fahd Causeway and the nation of Qatar and its capital Doha lie on a peninsula into the Persian Gulf. The holy city of Mecca lies to the west of Riyadh, as well as Jeddah on the Red Sea. Saudi Arabia is bordered on the south east by the United Arab Emirates, with their capital, Abu Dhabi, and metropolis, Dubai, only a short flight away. What Airlines Have Business Class Flights to Riyadh? There are daily direct business class flights to Riyadh from London with both British Airways and Saudia Airlines. The convenience of an uninterrupted trip complete with lie flat beds, lounge access, and priority boarding and baggage has the benefit of ensuring you arrive refreshed in your destination. If direct flights are not the most important aspect of your trip, why not fly business class to Riyadh on Emirates through Dubai or Etihad through Abu Dhabi. This way you can also include a fantastic stopover as well as the service, comfort, and facilities of these world class carriers. When planning your trip, contact Just Fly Business on 0208 417 1366 to talk to one of our business class specialists about what you require. Alternatively, enquire online and we’ll contact you to find what will make your business class flights to Riyadh perfect.